Louise Maclaren, As we are today, Norwich market scene. June 2014. Limited edition 3 block linocut print. 12 of this series available. Press button at the bottom of this page to take you to more versions of these prints for sale! Louise Maclaren, Still life in Shadow, February 2014. 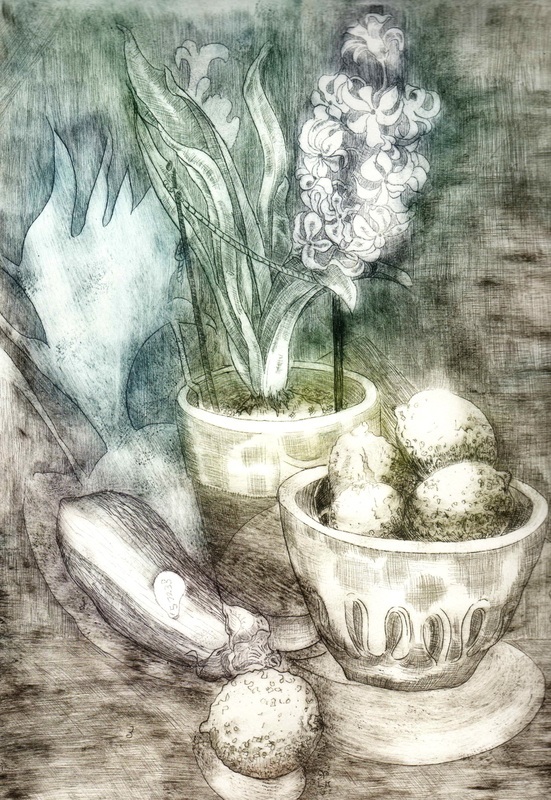 3/12 Drypoint limited edition prints. 7 of which are monochrome. Louise Maclaren; 'And with music, they bring light'. From the Cley Series; 3 block linocut with caustic etch, Printed by Louise in June 2015. A series of 27 limited edition prints. Combinations available of: Blue & deep purple, green & purple, yellow & purple, blue and yellow. Louise Maclaren, Still life in Shadow. February 2014. 2/12 Drypoint limited edition prints. 5 of which are in Colour. Louise Maclaren, The Chair, January 2014. 3/3 Drypoint limited edition prints.